With herbs readily available in his home garden, Pete can whip up this Argentine staple in a flash. But beyond convenience, homegrown ingredients are really the key to bringing out the best and freshest flavours of this sauce. 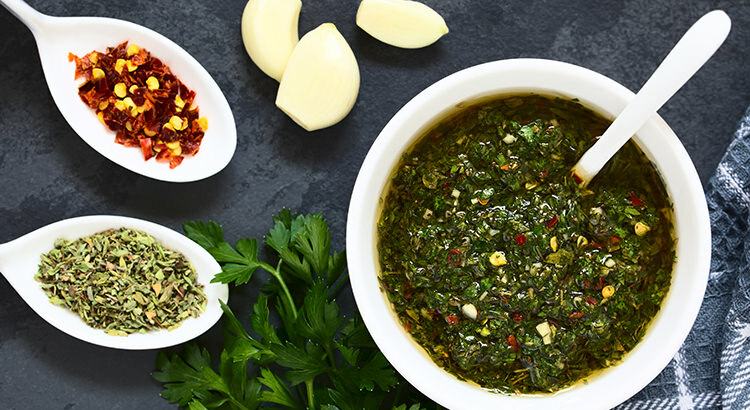 Chimichurri has two main star ingredients: parsley and garlic. Traditionally, it is drizzled over Argentinian asado or barbecue. But what makes this sauce so popular is its versatility. It works as a marinade, salad dressing, dip, bread spread, and so much more. This great recipe makes around two cups of sauce that you can store in the chiller. You can easily double it too because, trust me, you’re going to love it too much not to! And if you’re interested to know how you can start your own mini herb garden at home, do check out our schedule for the Plant, Grow, Eat: An Urban Gardening Starter workshop. Mince your herbs and garlic by hand. Alternatively, you can also use a food processor. Add the olive oil, wine vinegar, and chili flakes into your herb mixture. The amount of your olive oil depends on the amount of herbs you have. Just take note of the right consistency. The sauce should still be slightly viscous but not too runny. You can adjust the amount of chili flakes, too. Be reminded though that the longer your chimichurri sits in the fridge, its flavour grows more intense. Spoon the sauce on top of grilled meats or poultry then store the rest in an airtight jar. Keep it chilled.